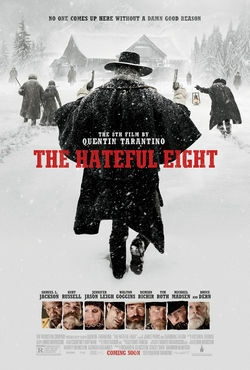 With The Hateful Eight, the movie that Quentin Tarantino delivered is for me similar in quality to Django Unchained, which makes it a contender for the worst films he created in his career. Of course, Tarantino�s worse is a lot better than most directors� best, but still, the fact remains. As with the previous western, there are several things which really grind my gears and where the film failed to maintain a connection to both my emotions and attention span. First and most serious of these is the film�s chapter that rewinds from the cabin fewer atmospheres to a period that took place a few hours earlier, taking the plot into the recent past to explain the protagonists� current predicament. This big revelation reveals nothing of value and just sabotages the big finale that can only be expected from a neo-western where a bunch of killers ends up spending a night in isolated, blizzard-stricken house miles away from anywhere. At this unnecessary rewind moment, the flaw of the film is exposed like poorly hidden acne under a white neon light � Hateful Eight uses the well-known fuel of the Tarantino thought processes, but this time, it burns weakly. While one of the many punches of the Inglorious Basterds was the moment when Aldo�s commandos kill Hitler, here, the only punch is the appearance of Channing Tatum�s character which is an undersell of an epic proportion. The clickety-clack of the endless dialogue is here as well, but just like the many racial insults, it all falls flat and lifeless, at least when compared to the director�s previous films. Other issues are also present in the film's 150-minute runtime, including a few jokes which apparently somebody found hilarious, like the two pieces of wood, nailed to the door, but for me at least, the humor kept on eluding me. Naturally, all of this is a disappointment coming from a man who expected greatness, but got only a fun and somewhat rambling thriller. The Hateful 8 experience is not particularly bad and the film keeps the viewer interested for 80% of its duration. The rewind segment is its weakest link; however, the rest is good, mainly thanks to the cast and the raw cinematography, to almost completely compensate this fact. The Hateful 8 is like a film created by an exceedingly gifted ghost director (as in ghost writer) who got the task of making a movie just like Quentin Tarantino does. The result is fine, but I still expected someone to kill Hitler if you know what I mean. At the same time, others are making neo-westerns like the fantastic Bone Tomahawk, which makes The Hateful Eight look like a runner-up.